We denounce the government of Colombia’s systematic persecution of the popular movement, human rights advocates, and social movement and ethnic leaders as a manifestation of the prevailing state terrorism in our country. 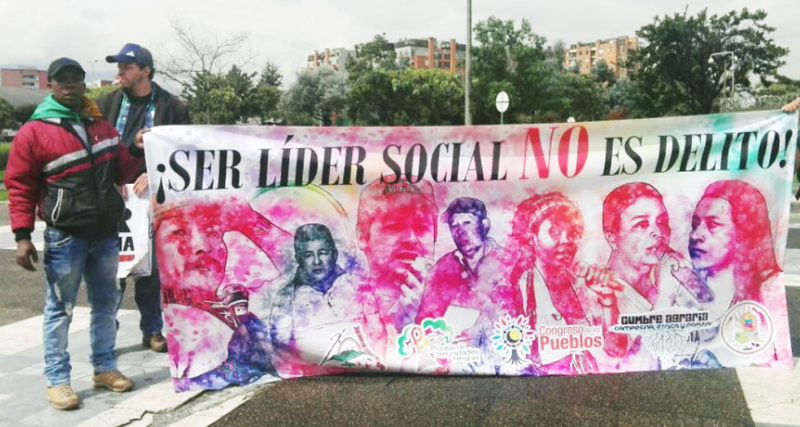 As of April 20, more than 30 persons belonging to social movement organizations, some of them former mayors and councillors in the departments of Nariño, Cauca, and Valle del Cauca were arrested as part of ongoing attempts to criminalize protest and social mobilization. This new wave of detentions comes on the heels of the mass detentions in southern Bolivar department in 2017 and the ongoing criminal investigations against representatives of the opposition Polo Democrático Alternativo party, among others, as part of the same modus operandi: trials by media without evidence that are usually dismissed, and the accused released, after several months of fruitless investigation. The goal of these maneuvers is to stigmatize the social movement and sow fear among organizations and communities that have been standing up to a wave of attacks and suffering alarming levels of casualties: more than 282 social movement leaders assassinated in the last two years. While the organizations pursue their day-to-day work of building a fair economy and a decent standard living for one and all, the government of Colombia continues to default on the agreements reached with the insurgencies and the social processes. The government is pursuing its response to the armed, social, and political conflict in areas such as the Chocó, Tumaco, and Catatumbo. It is trying to create a peace in which the winners exact tribute from the losers; it is giving clear signals of its unwillingness to keep its word and follow through on a negotiated end to the conflict. We deplore the hasty decision of the President of Ecuador, Lenín Moreno, to cease hosting the peace talks between the government of Colombia and the ELN guerrilla movement. This decision puts an end to Ecuador’s support for a political solution to the Colombian conflict; furthermore, given the looming possibility of a new U.S. military base at Manta, it clearly signals the geopolitical leanings of the Moreno administration. We thank the Ecuadorian people for their support for the peace talks between the ELN and the government, and we express our condolences and solidarity for the journalists who were murdered; this incident proves that war and the violence it brings are not just a problem for a single country, and that, to make peace a reality, we need to keep blazing paths to unity between our peoples. The undersigned movements and organizations hereby express our total commitment to life, justice, and dignity – which, taken together, constitute the peace we continue to strive for. We stress the need to bring organized international pressure to bear on our demand for effective protection of leaders of the social, ethnic, political, and popular processes in Colombia. Let us now, without delay, crystallize the friendship between our peoples in the form of actions demonstrating to the forces of death that they will never gain the victory over hope and justice. Comité por la paz de Colombia en Madrid. Centro Social Ocupado Autogestionado "Ex Snia"
Asociación de padres y familiares de las víctimas de Sucumbíos APFVS. Unión Nacional de Técnicos y Profesionales Petroleros. Colectivo por la paz en Colombia desde México, ColPaz.